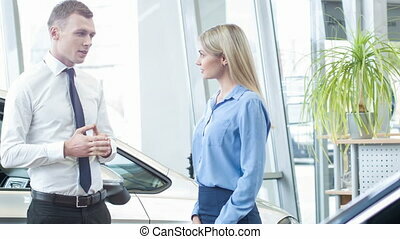 Female customer comes to car, seller consultant tells about automobile. redhead tall male in white shirt, trousers, tie, glasses explains woman advantages, disadvantages of product in showroom centre. Seller in work. 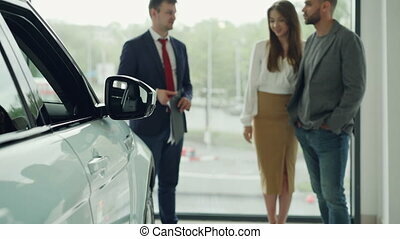 Young attractive male representative is busy talking about particular car and its multiple benefits. Sellers monologue. 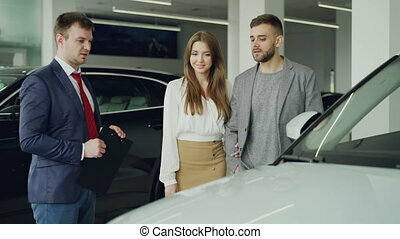 Young attractive male representative is busy talking about particular car and its multiple benefits. 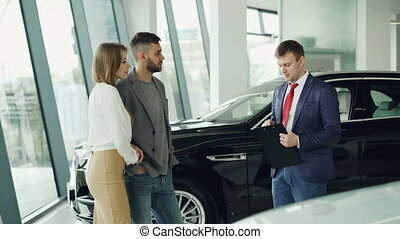 Husband and wife are choosing their first car together and talking to confident salesperson in motor show, happy woman is smiling and listening. Focus on new shiny automobile. Now her dream comes true. 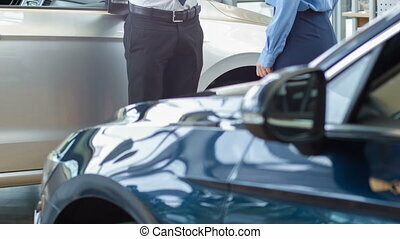 Auto business, car sale, dealership, rental, technology and people concept. Vehicle, rental, automotive concept. Commercial exhibition and rental vehicle concept. Young woman in a motor show. 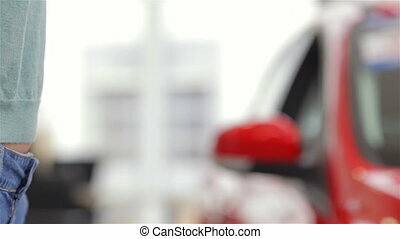 Woman buying the car. 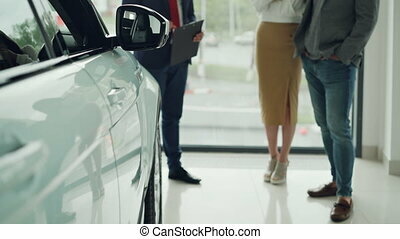 Young woman consultant in show room standing near car. Car dealer woman. 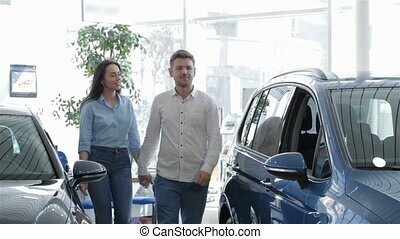 Low shot of prosperous people young couple buying new car in dealership and talking to helpful manager in suit. Shiny luxurious car is in foreground, large window is in background. 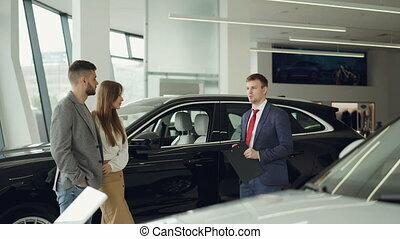 Salesman presenting executive class car to woman inside of show room. 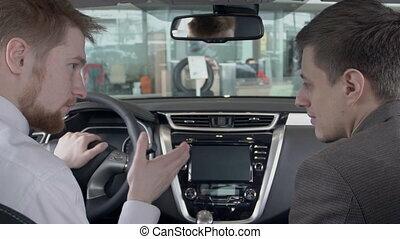 In slow motion dealer explains advantages of presentable automobile showing full details interior of vehicle to customer. Blonde female sitting in seat of driver and tastes comfort in use simplicity. Handsome consultant, in glasses and black and white suit, gives professional advices, helps client make right choice. Under spotlights brown sedan looks solid reliable. On background space room in centre. In the showroom woman sitting in a brown car, which the seller says. 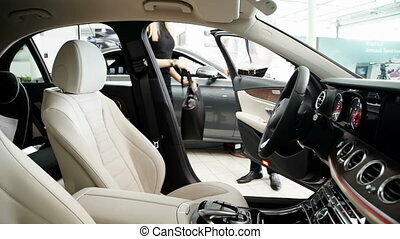 Potential buyers check the convenience of the car interior and smiling. Nearby is a dealer in a suit, stylish glasses and tells about the advantages of the machine. Beautiful woman happy with the presented model color like chocolate, she nods and looks forward to a good purchase. Sold with red hair leans to the female that would better convey information. The Motor young woman to sit in the new car and explore the interior. 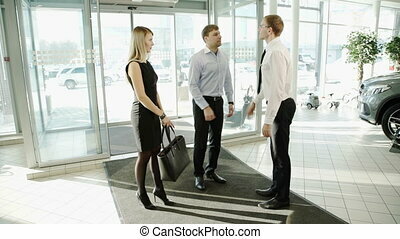 The employee opens the door and holds, that would help the client blonde to get into the driver's seat. Finishing inside the machine is made of white leather. European woman in a black short dress and high heels lands on the seat and look at the dashboard and hands touching the steering wheel. She wore a wrist bracelet shining luxury. Model posing square bag on the passenger seat. 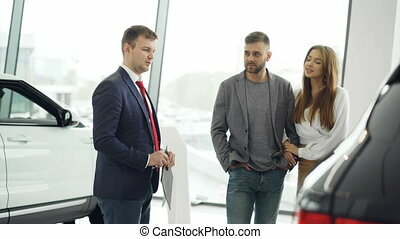 Worker man in automotive center meets couple client to display cars. redhead tall male manager in white shirt, trousers, tie, glasses welcomes female politely greets, talks about store services in showroom. 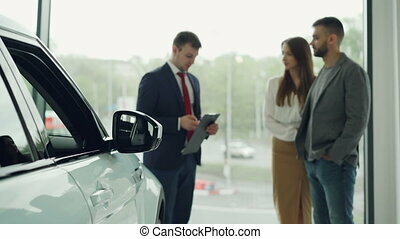 Talking in shop consultant buyer in spacious room in automobile score. Beautiful blonde lady in black dress, high heels shoes , husband in classic style clothes listening to assistant, shaking hands indoors. On background automatic glass doors to hall, parking, light afternoon day. Beautiful young woman listening to showroom condition at purchase. Blonde girl with long straight hair and brown eyes stares at the dealer shop and stores all the nuances. 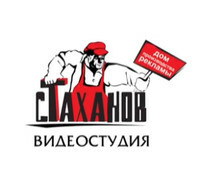 Officer also tells about the conditions of the existing shares and discounts. In the background, in a spacious and bright room facing new cars ready for sale. Female model has a light makeup with red lipstick and black open blouse.